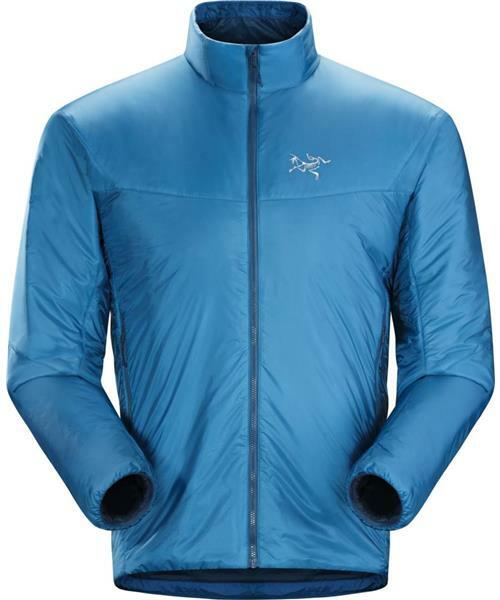 An intelligently designed belay jacket that provides alpinists and climbers with three-season warmth for minimal weight, the Nuclei SL leverages the lightweight performance of Coreloft™ 60g/m² synthetic insulation, an ultralight Arato™ 10 nylon shell, and highly efficient ergonomic patterning to deliver performance in a jacket that packs smaller than a one litre bottle and delivers effective warmth for a mere 255 grams. A DWR (durable water repellant) treatment and the synthetic insulation’s ability to retain warmth when wet make this a versatile choice for the shoulder seasons’ damp, dripping belays. Articulated patterning and gusseted underarms provide extended mobility without sacrificing coverage. The Arc’teryx Trim fit accommodates light layers, but stays close to the body for a higher level of thermal efficiency, and Arc’teryx e3D (ergonomic 3-Dimensional) patterning utilizes extra space in key joint areas to bring an added level of use specific articulation. Simple elastic binding around the cuffs is light, streamlined and creates a secure fit. An intelligently designed drawcord at the hem seals out drafts and tucks up and into the jacket to stay out of the way of gear loops, ropes and rock. Arc’teryx designs with focus and discipline. Weight needs to balance with performance, so the Nuclei SL is as streamlined as possible without sacrificing necessary features. The insulated hand pockets are positioned to stay out of the way of hipbelts and harnesses, and employ minimized zippers to shed grams and streamline the jacket’s profile. Secured in a pocket, the included stuff sack can be easily removed and clipped to a harness or pack. The Arc’teryx No Slip Zip™ secures the closure with a series of small bumps spaced every twelfth tooth to hold the slider and prevent self opening, but still unzips with a single hand for rapid ventilation.